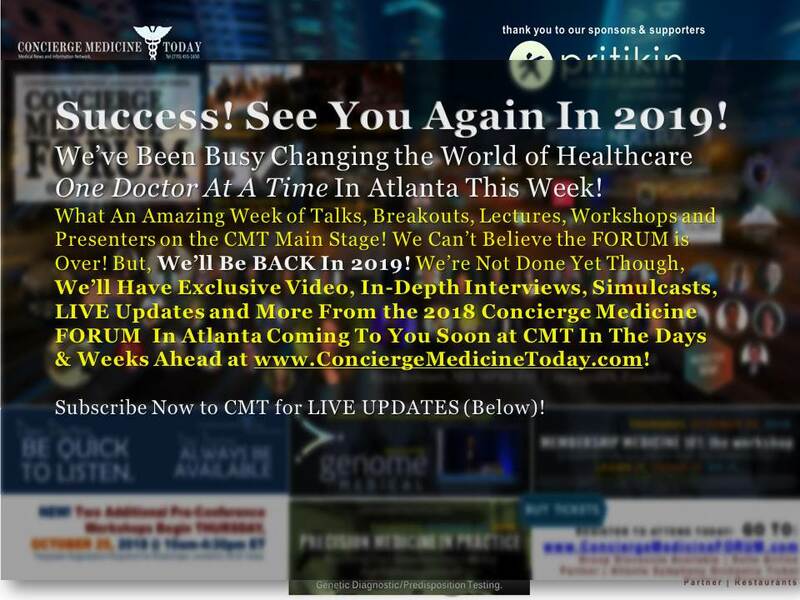 NEW | CMTs “Festival of Quotations, Video + Audio + Lessons Learned” In Concierge Medicine + Helpful Advice ! 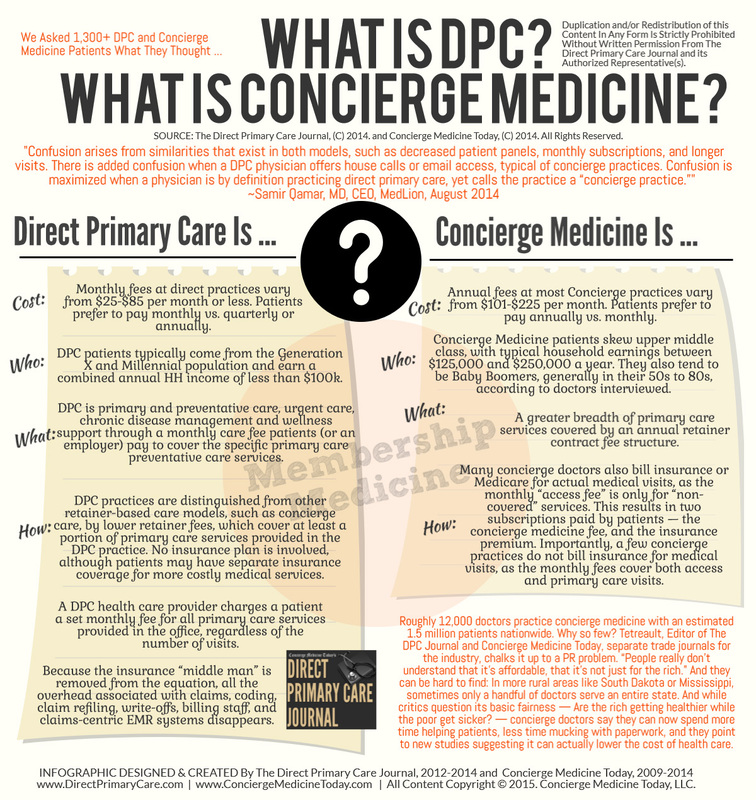 Brief And Abridged History Of Concierge Medicine And The DPC Healthcare Marketplace. Concierge Medicine is a form of “Membership Medicine” in which doctors provide medical care to Patients generally providing 24/7 access, a cell phone number to connect directly with their physician, same-day appointments, visits that last as long as it takes to address their needs and varying other amenities. In exchange for this enhanced access and personal attention, the Concierge Doctor receives a fee (most fees average between $135-$150/mo., Source: AskTheCollective.org; 2014) which enables them to increase the amount of time they spend with Patients. “We are a family of mom, dad, and 10 year old daughter,” says a mother in Marietta, GA. “Dad’s retirement from his job means leaving his insurance plan. 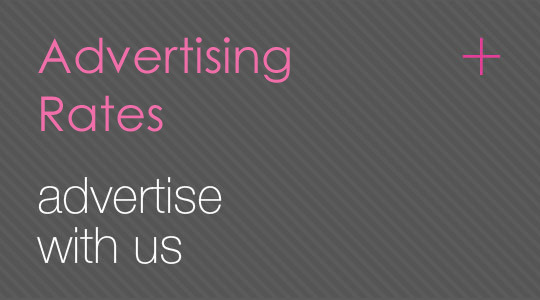 We are healthy and looking for affordable medical care.” A Concierge Doctor becomes the source for all things medical. 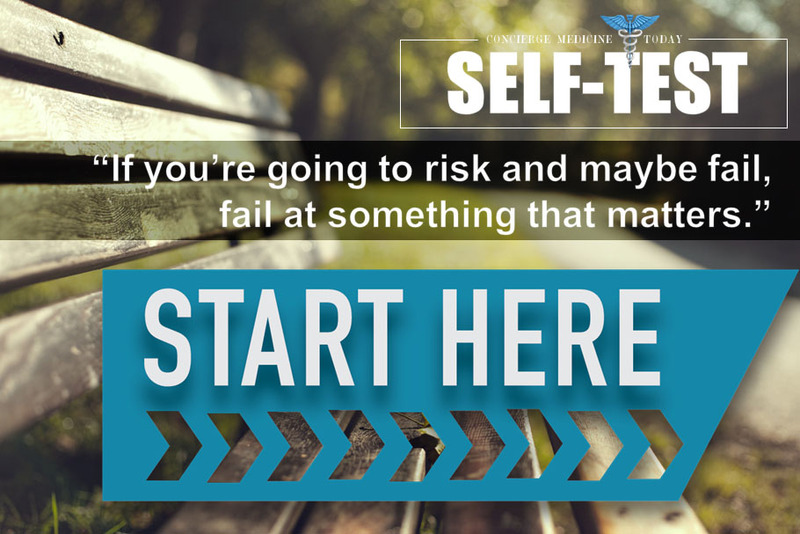 Essentially, you become a trusted friend, advocate and stand fully prepared to help your Patients navigate the complex healthcare system. In the event of emergencies, hospital care is closely monitored, and specialists are often personally briefed and debriefed by you on behalf of your Patients. “Even if you (a Patient) have insurance, you still do not have access to care,” says Dr. Chris Ewin or 121MD in Dallas/Fort Worth, TX. “You can have all the insurance you want. 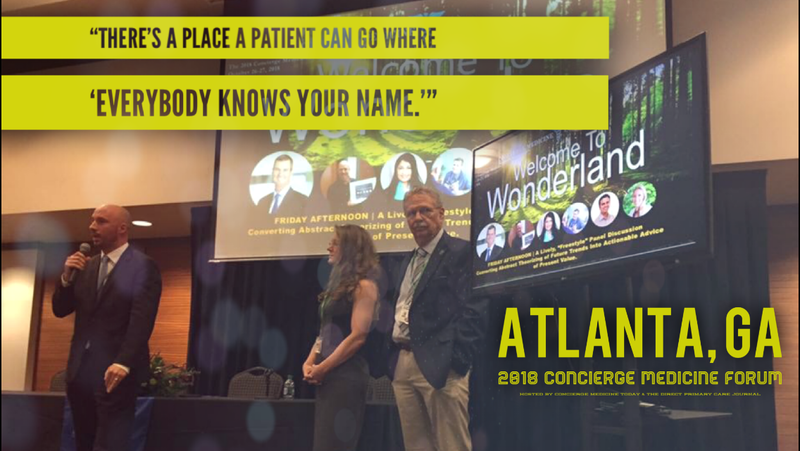 You still cannot get in to see the doctor.” This is why thousands of people are now actively searching for a Concierge Doctor or a DPC physician. They also discover that out-of-pocket costs to this type of doctor can actually save them thousands of dollars a year. At the same time, they can have their doctors cell phone on speed dial. 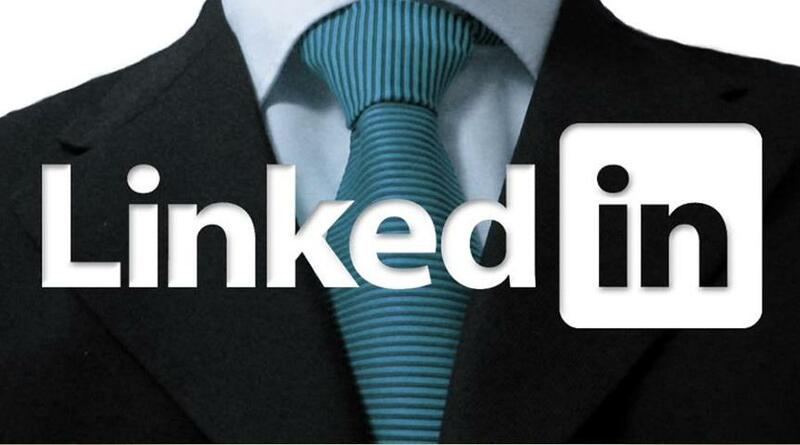 Business Models Used …Part 1, 2, 3 and beyond year one. 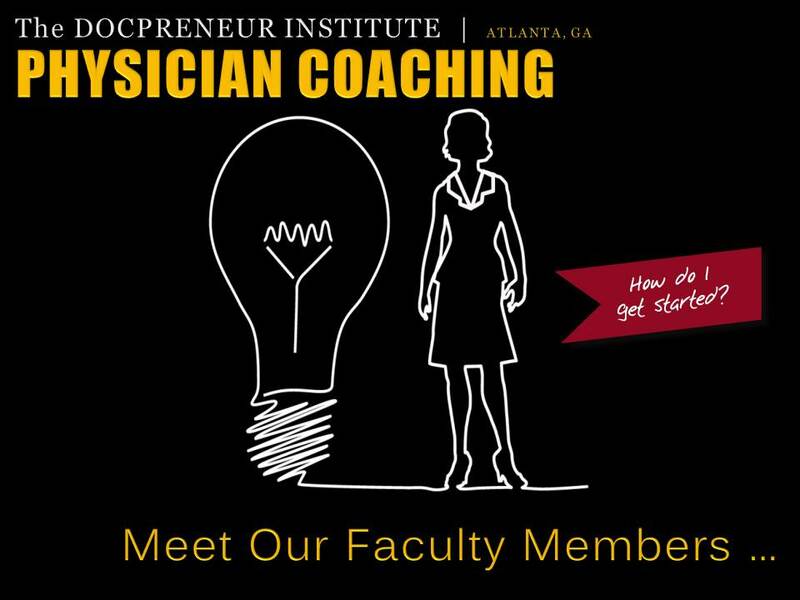 PART 1: DPC and Concierge Medicine Models: What’s Best For Me? 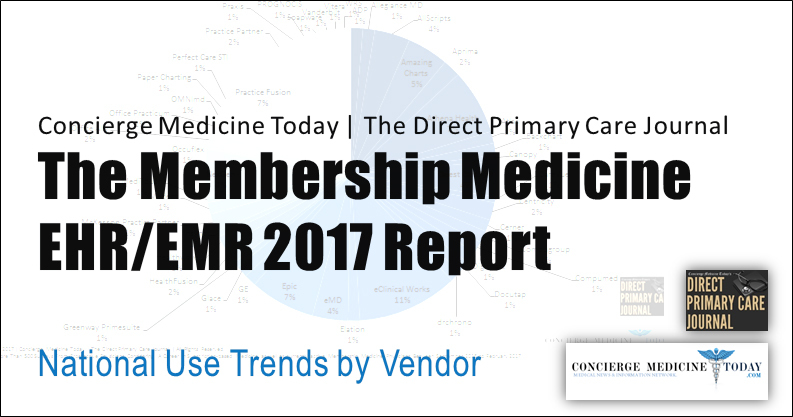 Concierge Medicine Market Research and Feasibility Study: 8 Great Resources. 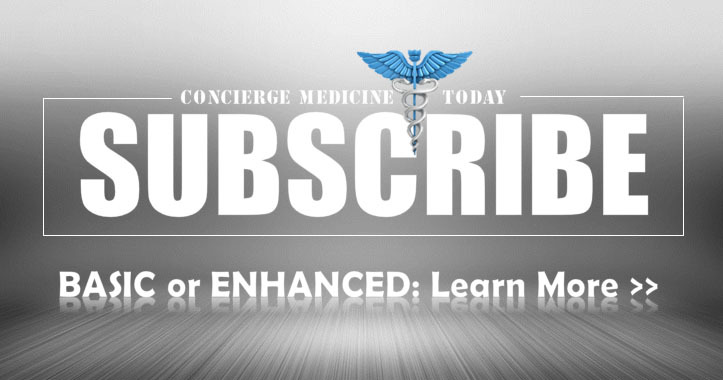 BUSINESS: Should You Franchise Your Concierge Medicine Practice? Defining Direct Primary Care (DPC): What Is It? 1996: Dr. Howard Maron and Scott Hall, FACP established MD2 (pronounced MD squared) located in Seattle, Bellevue, WA and Oregon. They charged an annual retainer fee of $13,200 and $20,000 per family. 1999: Medical Professionalism Project-consisting of members of the internal medicine community, including representatives of ACP and the American Board of Internal Medicine, set out to draft a charter that could serve as a framework for understanding professionalism. 1999: Institute of Medicine releases the now famous report of medical errors, Patient safety, and professional integrity that caused further probing in physician exam rooms. 2000: Virginia Mason Medical Center in Seattle, WA began operating concierge medical services within its facilities and used some of the profits from the 5 physician practice to subsidize other programs and indigent care services. 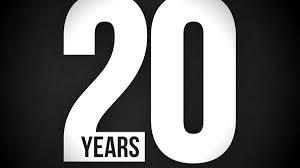 2000: MDVIP, founded by Dr. Robert Colton and Bernard Kaminetsky, in Boca Raton, FL. 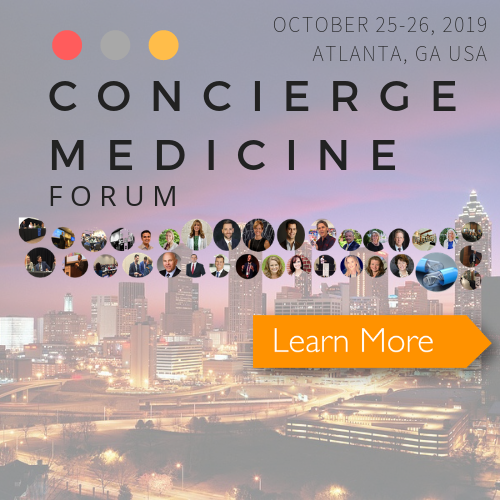 A brand of Concierge Medicine practice and management firm which has set-up more than 700 concierge medical practices with offices in almost every State across the U.S. Update: In April 2014, Procter & Gamble announced the sale of MDVIP to a private equity firm, Summit Partners. 2001: American Medical Association writes concierge physician guidelines: PRINCIPLES OF MEDICAL ETHICS. 2002: ACB Foundation , ABIM Foundation and the European Federation of Internal Medicine defines ethical principles and responsibilities contracts between Patient and physician, which is in a language that suggests both parties have equality, mutual interest and autonomy. 2002: Medicare addresses Concierge Medicine and retainer fees. 2002: Centers for Medicare and Medicaid, CMS, outlined its position on concierge care in a March 2002 memorandum. The memorandum states that physicians may enter into retainer agreements with their Patients as long as these agreements do not violate any Medicare requirements. 2002: Pinnacle Care establishes Patient care with a one-time membership fee for access to VIP service. 2002: The AMA counsel on medical services issued a report in June 2002 on Special Physician-Patient contracts. It concluded that retainer medicine was a very small phenomenon. 2003: American Society of Concierge Physicians was founded by Dr. John Blanchard. The association later changed its name to SIMPD, Society for Innovative Practice Design. 2003: AMA issued guidelines for boutique practices in June ‘03. 2003: Department of Health and Human Services rules the concierge medical practices are not illegal and the federal government the OIG, Office of the Inspector General, takes a decidedly hands off approach. 2003: American College of Physicians writes doctors struggle to balance professionalism with the pressures of everyday practice. 2003: June 2003 the AMA Council on Ethical and Judicial Affairs outlines guidelines for “contracted medical services”. The AMA House of Delegates approves these guidelines. 2004: GAO, General Accountability Office writes 146 concierge physicians in the U.S.
2004: Harvard University study finds that 55% of the respondents are dissatisfied with their health care, and 40% of that 55% agreed that the quality of care had worsened in the previous five years. 2005: The AOA, American Osteopathic Association adopts not to recommend and an official policy on concierge care. 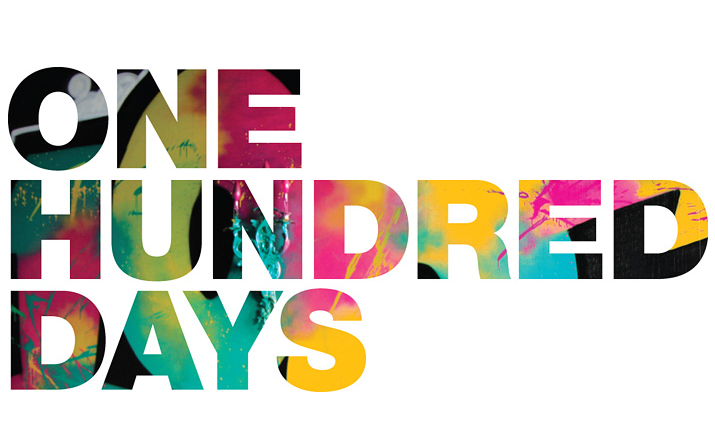 2006: MDVIP, a concierge physician practice management firm, reports that 130 physicians within their network treat up to 40,000 Patients worldwide. 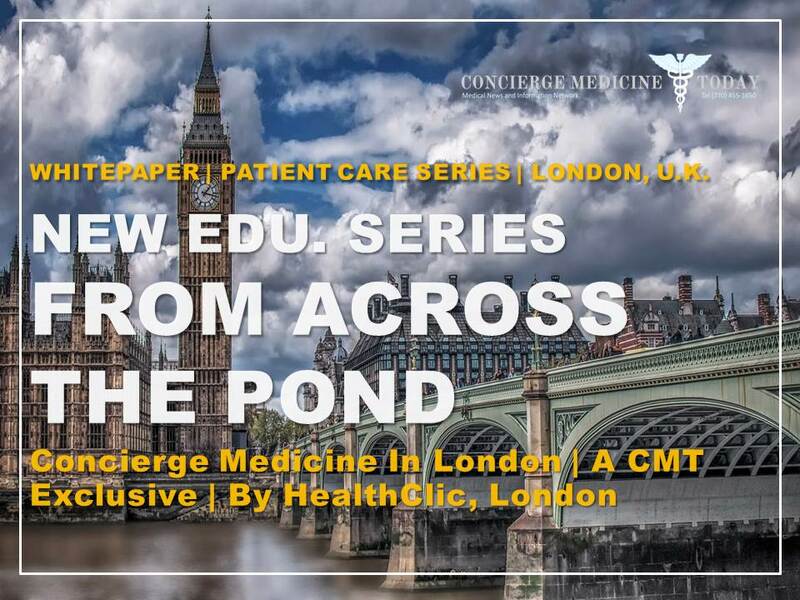 2007: Concierge Medicine Today, a concierge medical news agency opens its doors to be an advocate for news pertaining to the Concierge Medicine, retainer-based, boutique, private medicine and direct care industry. 2007: The term “direct practice” was first used in legislation in Washington in 2007 that clarified these practices were not insurance companies under state law-but they do provide basic, preventive medical care. 2008: Boasting an estimated 35 concierge physician practices, Orange County, CA appeared to be a leading hub of Concierge Medicine. 2008: Concierge Physician of Orange County (CPOC)– a non-profit group of existing concierge physicians was founded. 2009: Concierge Medicine Today, announces the formation of The Concierge Medicine Research Collective. 2009: Concierge Medicine Today, reveals that concierge medical practices across the U.S. are thriving in a recession. 2010: SIMPD reorganizes, expands its vision, and rebrands itself the American Academy of Private Physicians (AAPP). 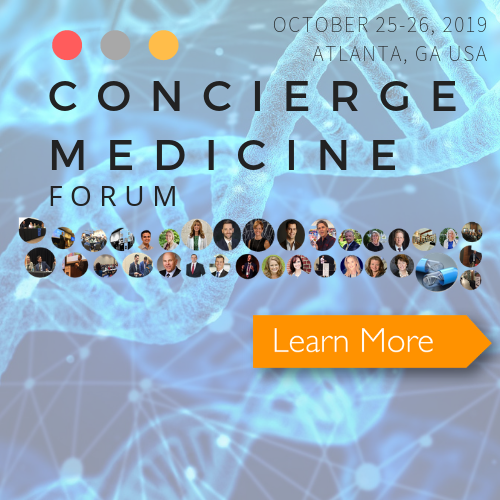 2010: Concierge Medicine Today, reveals the affordability of concierge medical and private medicine practices across the U.S. stating that over 62% of the programs offered to Patients cost less than $135/mo. 2010: According to a 2010 American Academy of Family Physicians survey, three percent of respondents practice in a cash-only, direct care, concierge, boutique, or retainer medical practice. “When you think of Andy Griffith-style medicine, the doctor had a clinic in the local town. Concierge medicine may prove fiscally responsible as well. 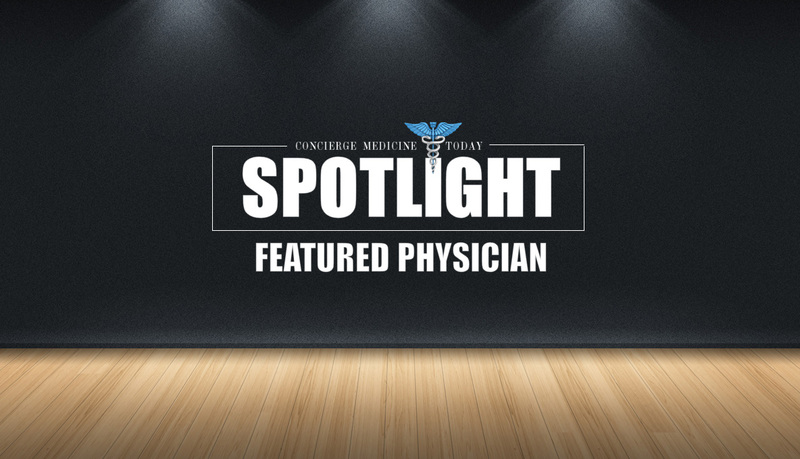 A study from MDVIP, a network of private physicians, found a 72-percent reduction in hospital admissions for concierge patients and a savings of more than $2,000 a year for each concierge patient. Doctors who engage in this practice can save the economy billions of dollars, according to Dr. Zwelling, by working with their patients on preventative care, staving off serious ailments and trips to the ER. Since concierge medicine is not insurance (it wouldn’t cover a trip to the hospital) many patients combine it with a high-deductible plan. Tetreault suggests that consumers think of health insurance more like auto insurance or fire insurance; it should be used for emergencies, not the day-to-day. You wouldn’t use car insurance to change your oil, rotate the tires or buy wiper blades. In the best-case scenario, the sum of the concierge fee ($150/month, for example) plus the bare-bones premiums for a high-deductible plan ($110-ish, theoretically) would pencil out to less than $328 per month, or what the Department of Health and Human Services cites as the “average” cost of health care. 2013: Three Year Analysis of Concierge and Direct Care Medicine Shows Encouraging Signs For Boosting Primary Care In U.S. Economy. 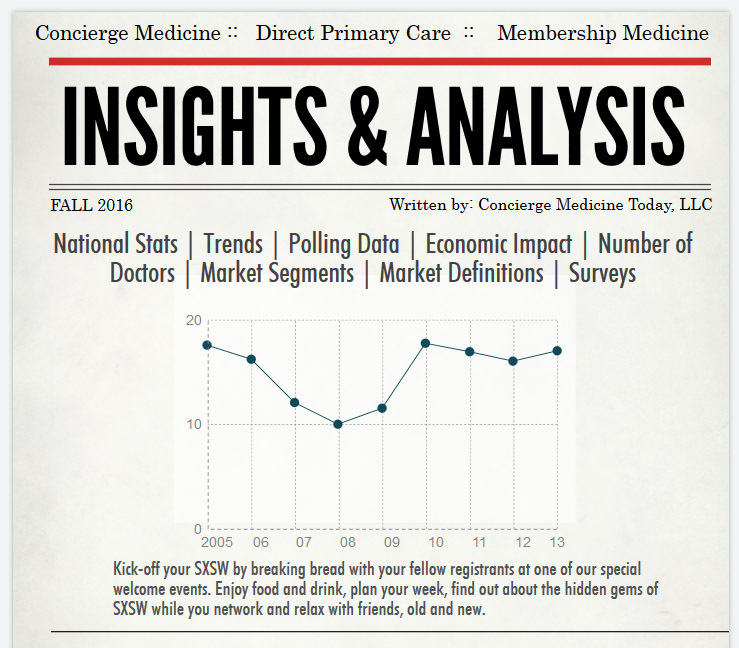 Data collected from Concierge Medicine and DPC doctors show encouraging signs across the U.S. from December of 2009 to December of 2012. 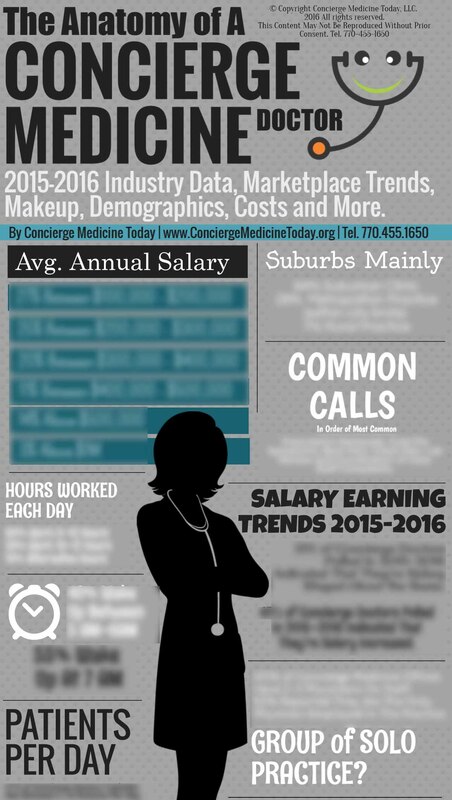 2013: New Data on Concierge Medicine Physician and DPC (DPC) Clinician Salaries and Released by Concierge Medicine Today. Data also looks at career satisfaction among Concierge/DPC physicians. 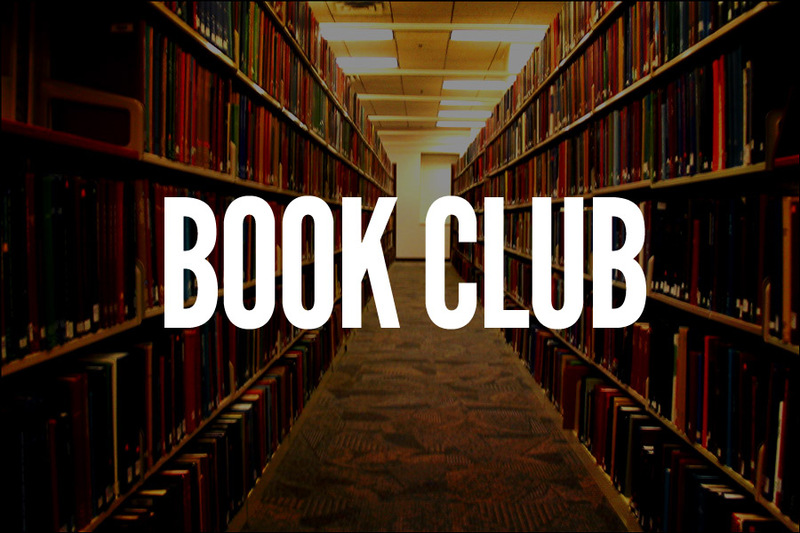 2013: On August 2, 2013, the Dare Center, Seattle, WA, invited concierge physicians, hospital administrators and medical center executives from across the country to participate in a roundtable discussion. This inaugural event took place at the Washington Athletic Club in Seattle. 2013: The DPC Trade Journal Launched. 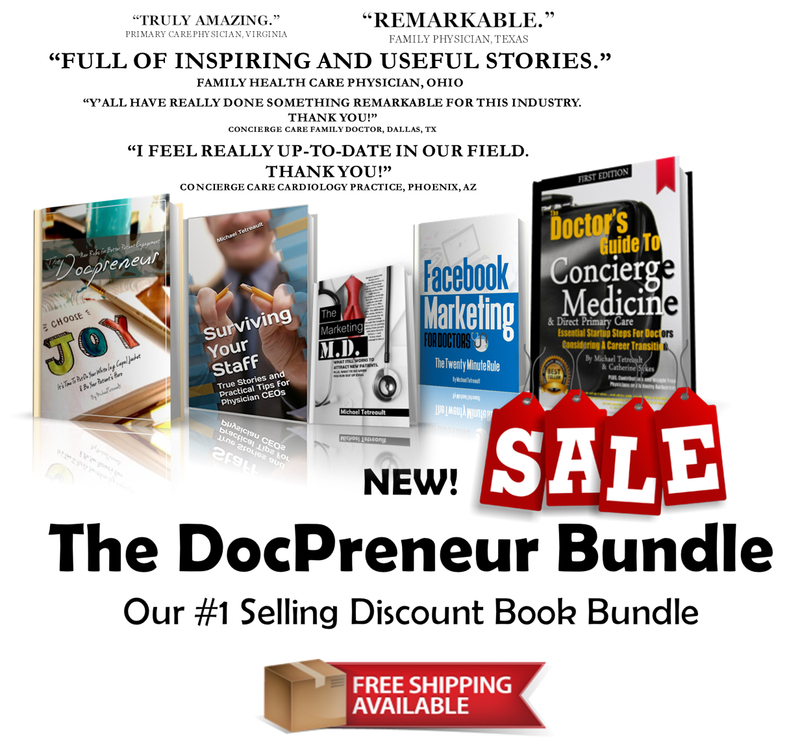 The DPC Journal works directly and indirectly with physicians, businesses and leaders, journalists and the media in the healthcare marketplace to help promote the distribution of news and information, policy initiatives and to reach out to physicians throughout the United States. www.DirectPrimaryCare.com. 2013: First National Gathering Focused On DPC (DPC) Held In St. Louis: October 11-12, 2013. 2014: New Association Formed, American College of Private Physicians (ACPP): Group to Focus on Credentialing Doctors, Advocacy to Employers, Unions, Government and the like to benefit industry nationwide. 2014: IRS asked to clarify HSA rules in letter: On June 17, 2014, Members of Congress wrote Commissioner of Internal Revenue John Koskinen asking for clarification on how the Internal Revenue Service (IRS) treats DPC Medical Homes with regard to Health Savings Accounts (HSAs). Senator Maria Cantwell (D-WA), who authored ACA Sec. 1301 (a) (3), allowing DPC practices to participate in health exchanges with Qualified Health Plans, took the lead on the letter and was joined by Senate Budget Committee Chairman Patty Murray (D-WA) and Rep. Jim McDermott, MD (D-WA), ranking member of the Ways and Means Subcommittee on Health. The three WA state lawmakers point out that The ACA rules on the Establishment of Exchanges and Qualified Health Plans Part I (CMS-9989-F) promulgated by HHS, clearly state that DPC is not health insurance, and that the law has its roots in a provision in WA state law (48.150RCW) defining DPC as a health benefit outside insurance. IRS Continues to give guidance that DPC plans are considered health plans under Sec. 223 (c) of the Internal Revenue Code (IRC), which prohibits HSA account holders with high deductible health plans from having a second “health plan.” DPC members have met with officials in the Department of the Treasury and continue to work with the administration and Congress to change the IRS definition so that DPC fees are qualified medical expenses under Sec. 213 (d) of the IRC and can be offered as a benefit complimenting Health Savings Accounts (HSAs) paired with high deducible health plans. 2014: Second National Gathering Focused On DPC (DPC) Held In Wash., DC., June 2014. 2014: Michigan DPC Bill Introduced as Louisiana Passes Law: On September 9, 2014, Michigan State Senator Patrick Colbeck (R-Canton) introduced S.B. 1033, a bill to amend the MI state insurance code to clarify that a DPC agreement is not subject to state insurance regulation. DPCC has provided resourced to Sen. Colbeck, and we are watching developments in state legislatures around the country as they prepare for the coming sessions. This summer, Gov. Bobby Jindal (R-LA) signed similar legislation; Senate Bill No. 516, making Louisiana the latest state to create law to define DPC practices correctly outside the scope of insurance regulation. Stay tuned for further updates as the legislative sessions kick off in this coming January. 2014: September 2014, American Academy of Private Physicians (AAPP) Course Corrects Physician Association, citing that the industry’s association is focusing on five key areas. Those include: legal compliance for doctors, innovative learning tracks at national meetings, physician networking, legislative and lobbying initiatives and staying up to date on new and emerging technologies..
2014: In October 2014, at the AAFP Assembly, a DPC Track is added to the agenda in Washington, D.C. It was called the “Health is Primary” initiative, a key business model for success touted by the AAFP (American Academy of Family Physicians). 2014: Washington State OIC issued DPC Outlook in Washington State. The OIC report insinuated that DPC is losing ground in terms of patients and that our monthly fees have been climbing (presumably as we head toward concierge medicine pricing). 2014: The DPC Journal releases its industry-wide definition of DPC, the 5-Minute Guide: What Makes DPC Different From Concierge Medicine. Also releases 2-Year analysis of DPC marketplace data. 2015: Michigan State Sen. Pat Colbeck, R-Canton, believes the path to providing Michigan citizens with access to higher quality, lower cost health care has been cleared following Gov. Rick Snyder’s signature into law of Colbeck’s SB 1033 (Public Act 522 of 2014). The new law in Michigan assures physicians who adopt a direct primary care service business model that the administrative burden associated with insurance regulations will not interfere with their treatment of patients. Physicians who offer direct primary care services provide specified services for a monthly subscription fee that usually vary between $50 and $125 per month. 2015: The United Hospital Fund Releases A Report, Convenient Care: Retail Clinics and Urgent Care Centers In New York State. This report is relevant to Concierge Care and the DPC healthcare space because: Although based on a small sample from a single group practice in Minnesota, the study found that patients who visited retail clinics had lower total costs than matched patients who visited the acute care clinic (Rohrer, Angstman, and Bartel 2009). A more recent study of adult primary care patients, also in Minnesota, found that the odds of return visits for treatment of sinusitis were the same whether patients received care at a retail clinic or in a regular office visit (Rohrer, Angstman, and Garrison 2012). Perhaps more telling, a larger study of spending patterns of CVS Caremark employees found a significantly lower total cost of care in the year following a first visit to a retail clinic compared to costs incurred by propensity score-matched individuals who received care in other settings. In total, retail clinic users spent $262 less than their counterparts, with savings stemming primarily from lower medical expenses at physicians’ offices ($77 savings) and reduced spending for hospital inpatient care ($121 savings). Retail clinic users also had 12 percent fewer emergency department visits than their counterparts (Sussman et al. 2013). The UHF saw nothing analogous on the impact of urgent care centers on total costs, but one study found that initial use of an urgent care center significantly reduced emergency department visits without increasing patient hospitalizations (Merritt, Naamon, and Morris 2000). Those results should be cautiously interpreted, however, given the study’s design limitations. Conversely, in September 2014, the MDVIP model also was shown to have saved some $3.7 million in reduced medical utilization for the 2,300 MDVIP Medicare Advantage patients over two years. Savings were $86.68 per patient per month in year one, and $47.03 per patient per month in year two, compared with patients who did not join an MDVIP practice. The two-year study explored preventive healthcare’s ability to improve outcomes by creating a closer, personalized physician-patient relationship and focusing on disease prevention for Medicare Advantage. 2015: PinnacleCare, a leading health advisory firm, studied the impact of an expert second opinion on medical outcomes. Researchers collected data on 1,000 cases over a three‐year period and found that almost 77 percent of medical interventions led to changes in diagnosis, treatment, and/or treating physician. PinnacleCare gathered data on patient outcomes from their interventions over a three‐year period. In a sampling of 1,000 cases with known outcomes from 2012‐2014, 41% resulted in transfer of care to a COE or expert provider with 34% resulting in a change in diagnosis, treatment, and/or course of care. A total of 18 patients were able to avoid unnecessary surgery as a result of a PinnacleCare intervention. The data demonstrates the potential for health advisory services and second opinions to optimize outcomes and avoid needless expense. One of the persistent challenges in health care today is access to expert physicians. 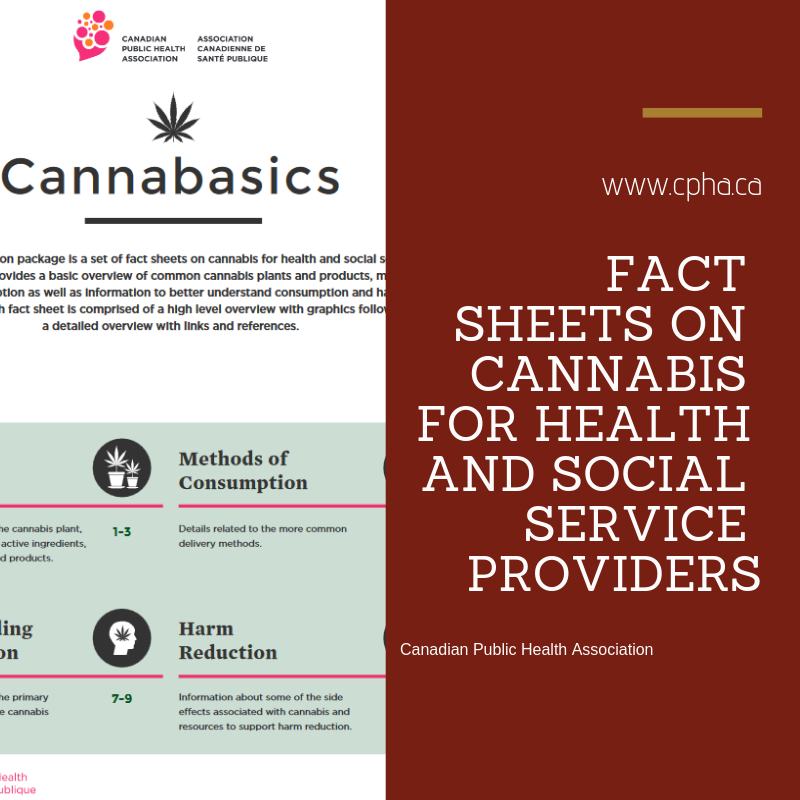 With consumer directed health care plans, the value of health advisory services becomes even more evident as consumers struggle with vetting appropriate providers and treatment options for their complex conditions while seeking timely access to the care that they need. PinnacleCare is committed to providing objective, concierge‐ level support with the expert resources and access needed to help consumers tackle these complex challenges. “There are no insurance codes for ‘cure,’” says Dr. Garrison Bliss of Qliance, based in Seattle, WA.